Just when you think your city’s sports life is down and out, here comes that lovable ex-convict with his legendary hair and enthusiasm for seemingly everything in life (Including George W. Bush) speaking great things about Buffalo and how it deserves the World Title Fight. 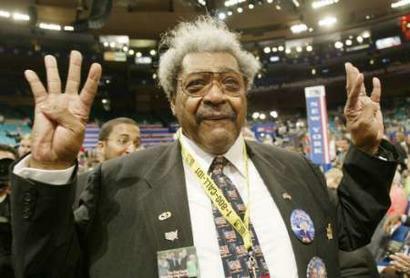 Don King has been trying to give Buffalo the grandest most stupendous most spectactular, amazing, epic, legendary, super-duper sporting event in the history of mankind. Even though his last attempt failed, it seems as if Buffalo has a very good chance the next time around. With the strong possibility of Joe Mesi coming back to boxing, and his father making frequent appearances at my old neighborhood church (St. Josephs University Distrct! Holla back!!) it seems that maybe, just maybe, Don King could bring a national-even World attraction to our humble city. The only question is if Buffalo is ready to accept it or let such a grand opportunity slip just like they seemed to have done the last 50 years. Author’s Note-Mr.Mesi’s appearances at my former local church have nothing to do with the furtherment of Boxing in BUffalo, I just wanted to give a shout-out.